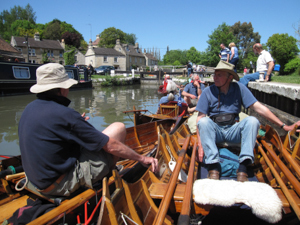 The Society was founded in 1980 to promote the use and enjoyment of traditional, non-powered craft, mainly skiffs, gigs, dinghies, punts and canoes. Maintaining historical records for the benefit of members and future generations. Whilst the Society’s interests centre around the traditional hand-built timber craft so popular in Victorian and Edwardian times, all unpowered boating is encouraged and members with other types of boat are most welcome. We offer help and advice on learning the skills of handling boats, restoring and maintaining timber craft, buying traditional boats and can offer valuations for insurance purposes. We particularly encourage young people to take up rowing and sculling as a sport and sponsor novice sculling and punting events at the Skiff Championships and Thames Punting Championships. Newcomers are especially welcome and you do not have to own a boat to join the Society. The Society owns a quad skiff, Sgian Dubh, and a double camping skiff, Thomasina, which are available for members’ use and are normally kept at the society boat store, Port Fonty. We work with skiff racing and punting clubs. We are not a static museum, nor are our interests centred solely on the Thames. The Society’s quarterly magazine, Scull, Pole & Paddle, carries articles of general interest, reports on activities, advertisements of boats etc.for sale, regular features and notices affecting navigation. Additional bulletins keep members up to date with news from the river bank and other Society information. We do not have a Clubhouse and our members come from a wide area, but we do now have a base called Port Fonty at Caversham Lakes, Reading. There is access to the River Thames and meetings are held here in the summer for advice, instruction and ‘simply messing about in boats’. This facility is open to members to launch, and recover boats as well as providing a convenient over-night stopping point in this area for cruises on the river. We have constructed a boat storage building on the site where members may rent space to keep their boats. We participate in rallies, regattas and festivals along the Thames, its tributaries and elsewhere and we arrange social events with a boating theme. During the summer months, weekend and longer cruises are organised at a relaxed pace along various waterways in this country and on the Continent. In the winter months social evenings incorporating a relevant topic and monthly weekend walks, usually with a watery theme, are arranged. The Thames and Kennet and Avon Canal are favourite haunts for cruises. We have also visited Cornwall, Norfolk, Gloucestershire, Cumbria, Warwickshire and Lancashire. Nivernais, Argentina and Poland. Holland is another favourite location for our longer trips. Special events on the Thames have included the Centenary of the Opening of Richmond Lock 1994, the Maidenhead River Pageant 1995 and the Thames Tudor Pageant in 2009, Lord Mayor’s Flotilla, Olympic Torch Procession and the Queens Diamond Jubilee pageant In 2012. The annual Membership costs are £20 for single and £25 for family. If you would like to join the Society please email membership@ttbs.org for a membership form.